My point is, all of those adorable things you are pinning and never trying? Get on it. Try one. The worst thing that will happen is that you will hate it and you will have wasted a few bucks on materials. The best thing that could happen? You could make something awesome that people will look at and say, “I love that!” and then, you get to say, “Thanks! I made it!”. There is some major satisfaction in those simple words, people. Serious satisfaction. Here’s what I made this weekend. I think it’s pretty darn beautiful, if I do say so myself. You know what is the best part of this? One of the things I love about how these little paintings came out is that I actually messed up when prepping. I was working from these instructions from Burlap and Blue and I was supposed to use painters tape to block off the edges. Well, I didn’t feel like searching high and low for the painters tape when I had perfectly good Scotch tape right in front of me. I told myself I would just press it down really well into the canvas and it would be fine. Wrong. As soon as the water hit the canvas it busted right past the Scotch tape. But, guess what? I kind of loved how it looked! I learned quickly not to go to crazy with water near the tape or it would be a real mess (see how I’m learning from my mistakes? :-)), but I definitely like the bit of bleeding through that was going on. **Assuming you only have to buy the canvases and the watercolors, the materials will cost about $21. If you have Amazon Prime (and you totally should) you can have this in two days with free shipping. Evenly tape off your canvases. I just went around the square and taped it off based on the width of the tape. Press the tape down firmly. Think. Yes, take a minute to think. I wanted to do a “season” theme with my canvases, so I thought about what colors were wintry, springy, summery and autumny. (All words, trust. I don’t care what spell check says). Paint. Dip your brush in some water and then in some paint and spread it on the canvas. There isn’t much to tell here. My only tip is to not let TOO much water get under the tape. Other than that, go with your gut. 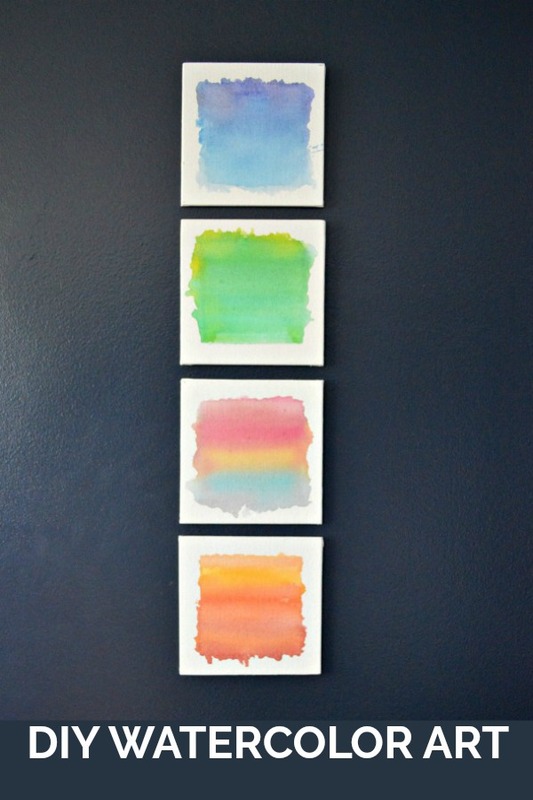 If you think the colors look pretty together, then chances are you are going to love your painting. Don’t sweat it. Experiment. Note that the canvases I chose come in a pack of 12, so if you hate one, try again. Four steps and about 20 bucks to beautiful art, guys. Oh, and bragging rights, of course. PS, I tried my hand at watercolors again! 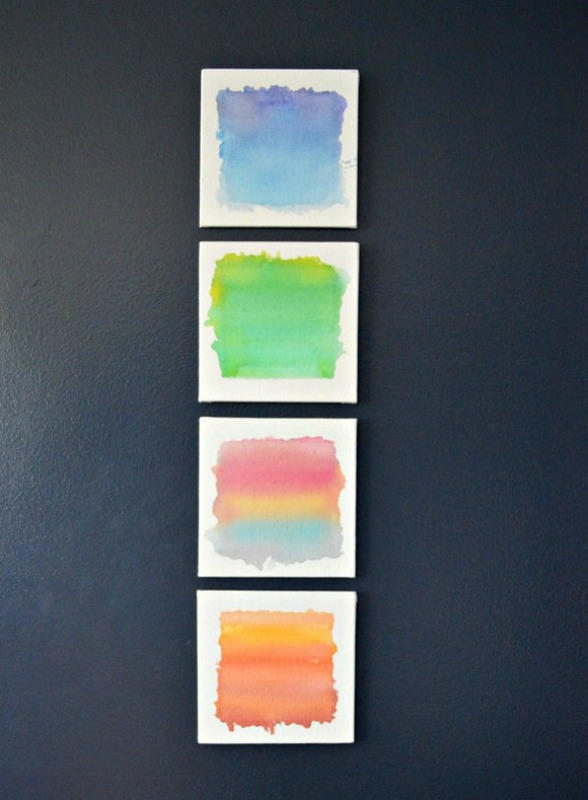 Check out this post on Easy Watercolor Painting Tips and see what I made!